Reprinted with permission from the Edenton Historical Commission, 2012. The 1886 Roanoke River Lighthouse is the last and grandest of fifteen screw-pile Light Stations on North Carolina sounds and rivers. The lighthouse (left), as it looked when completed in 1887, is called a screw-pile design because of its original support system. Each piling was literally screwed into the river or sound bottom so they would not pull out in heavy storms. 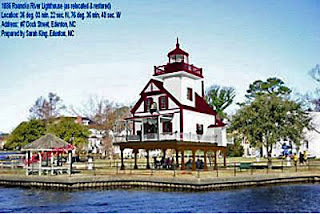 The Roanoke River Lighthouse, now located at Edenton, is believed to be the last extant example in the United States of a rectangular frame building built for a screw-pile base. The lighthouse was in commission from 1887 until 1941. On February 6, 1832, William Biddle Shepard (1799-1852) petitioned the U.S. House of Representatives for a light station to help sailors find safe entrance to the Roanoke River. In 1834, the U.S. Congress provided $10,000 to construct a light vessel at the mouth of the Roanoke River. A 125-ton, three-masted sailing ship was stationed across Albemarle Sound from Edenton Bay. Whale-oil lights covered with red, green and blue lenses, visible for 13 miles, hung 43 feet above the water. During the Civil War, the Confederacy controlled the light vessel, designated MM, until Union forces captured Plymouth in late March 1864. Trying to block the Union ironclad, Ram Albemarle, the Confederates scuttled the lightship 40 miles up the Roanoke River. In 1866, the government built a one-and-a-half story screw-pile lighthouse. Fueled by whale oil, it was first lit in January 1867. A fire damaged the structure in 1885. After ice on Albemarle Sound cut the lighthouse’s pilings in February 1885, this two-and-a-half-story lighthouse was authorized in 1886 and the present cottage-style building was erected on a screw-pile base at the location in 1887. The tower was fitted with a 4th order Fresnel lens. The current lens, on loan from the Town of Edenton, was made by E. Barbier and Co. of Paris. The US Coast Guard deactivated the Lighthouse in 1941. In 1955, the Coast Guard sold this and two other surviving North Carolina sound lighthouses to Elijah Tate for $10 each. Tate (1902-1985), a Coinjock resident, was a former lighthouse Service employee. While Tate was moving the Roanoke Marsh Lighthouse, the barge tipped and dumped that lighthouse. In rough weather on the Currituck Sound, Tate also lost the second lighthouse, which was probably the Wade Point Lighthouse. 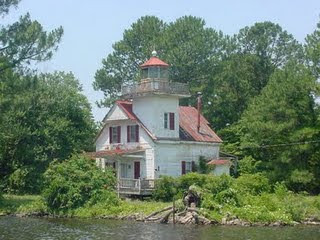 After this bad luck, Tate sold this 1886 Roanoke River Lighthouse to Emmett Wiggins (1921-1995) for $10. Because Wiggins had a marine salvage business, he may have attempted to move the first two lighthouses for Tate. 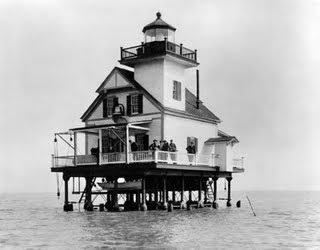 Wiggins moved Tate’s third Lighthouse across Albemarle Sound to his land at Edenton in 1955. In 1946 Patsy Ann Chappell Brown (Miss Pattie), widow of M. G. Brown, sold him land at the mouth of Filberts Creek in the Albania neighborhood west of Edenton. Wiggins sank the Landing Craft Infantry (LCI) on which he had moved the Lighthouse and filled marshland around it with riprap. He lived in this Lighthouse until his death. The lighthouse suffered significant damage from Hurricane Isabel in 2003. In 2007, the Edenton Historical Commission bought the Lighthouse for $225,000 and paid $75,000 to move it to Colonial Park in downtown Edenton’s waterfront. The NC Departments of Transportation and Cultural Resources agreed to restore the Lighthouse (left- artist rendering of the future look of the lighhouse). Revised plans call for the Lighthouse to be located over water. In May 2012, the Lighthouse was moved over the water just off Colonial Park with plans to build a walkway and restore the interior in an effort to open the Lighthouse to the public. History: The 1886 Roanoke River Lighthouse; Text and image reprinted with permission from the Edenton Historical Commission, 2012. River Lighthouse History Preserved in Eastern N.C, InSites : news from the North Carolina Division of State Historic Sites ; Monthly; Vol. 18, no. 9 (Sept., 2002)-. From the North Carolina Department of Cultural Resources Digital Collections. Carolina Comments, 1952. From the North Carolina Department of Cultural Resources Digital Collections.